Netflix is edging a step closer to its name with a test of streaming only service in the United States. 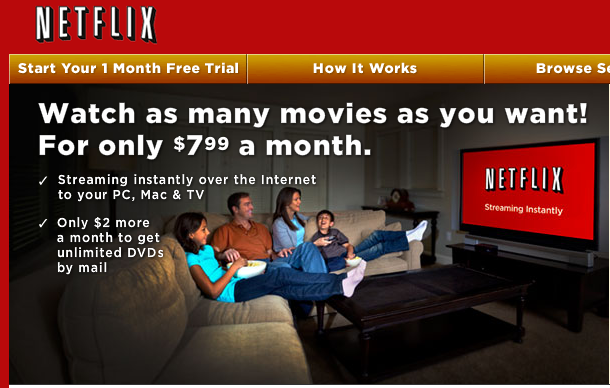 The new offering allows users to purchase a net-only subscription for $7.99 a month. Adding DVD rentals is an option for an additional $2.00. This represents a $1.00 price increase from recent offers of $8.99 for unlimited streaming and unlimited DVD rentals with 1 DVD out at a time. The online selection still lags its DVD catalog. That’s unlikely to change in the near future. Netflix has been de-emphasizing DVDs lately. For good reason: streaming is much cheaper than postage. It costs roughly 5 cents to stream a movie vs. close to $1 per DVD rental. It has put a substantial emphasis on streaming, with Netflix capabilities embedded into dozens of devices, including Apple TV, Google TV, blu-ray players, iPads, iPhones, TVs and game consoles. The company also recently entered the Canadian market with a CDN$7.99 streaming only plan with no option for DVDs. This entry was posted in netflix, television. Bookmark the permalink.